In my part of the world, we don't have snow during the holidays. And so, it has always been a personal dream to experience a white Christmas, to enjoy the sight of a snowy Christmas evening with pine trees covered in snow and see snowmen created by kids. One day, perhaps. But for the meantime, I decided to realize my dream with some Christmas inspired nail art. I called this nail design, Night Before Christmas. The idea is to create a design that would depict a peaceful ambiance of a Christmas evening, particular Christmas eve when everyone is at home with their families enjoying a feast. I thought of pine trees and a snowman for the accent nail. When I first thought of this design, I was hesitant because I felt it would be difficult. I wanted to paint small pine trees. Well, I have small nail beds. But the idea was persistent so I took on the challenge. It turned out relatively easy to do. I used Dazzle Dry Night to Remember in 2 coats as base color. I thought it was the an amazing midnight blue to go with the design. The shimmer of this polish made it more appropriate. This bottle was a bit tricky to apply because of its slightly thick consistency. Gorgeous, nonetheless. For the snowy nail tips, I used Dazzle Dry White Lightning. I hand painted the design using acrylic paint, nail art brushes, and a dotting tool. I painted pine trees on all my nails except for the accent nails wherein I decided to paint a snowman just to break the monotony. Accent nail on my index finger on my right hand and on my ring finger on my left. Painting tiny details was a challenge, to me at least. But I'm happy with how this turned out. I know that you have been requesting more video nail art tutorials. I finally had time to do one! I was particularly motivated by a new set of nail art brushes and acrylic paints that I've acquired recently. I'll be publishing a review soon. For now, I hope you'll find this tutorial inspiring and helpful. I included a few personal nail art tips. I would love to read your thoughts about this. Would you be willing to try painting this design? 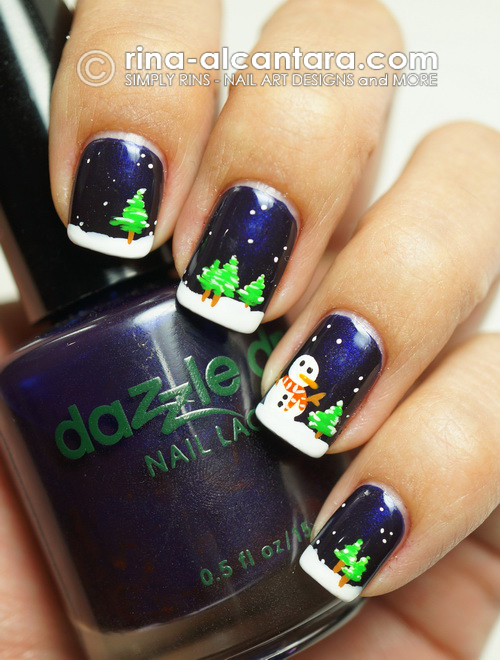 You may view my previous Christmas nail art designs here. Here in Hamburg (Germany) it is freezing cold at the moment! Wow how lovely is this? I love this nailart and your precise work. This is a really, really cute design!!! <3 it! Wow, it's amazing to watch you work! Super cute design Rins!